July 2014 has been a very interesting, and momentous, time for the Aircraft Carrier Alliance building two aircraft carriers for the Royal Navy with some further interesting evolutions to come through the remainder of the summer. 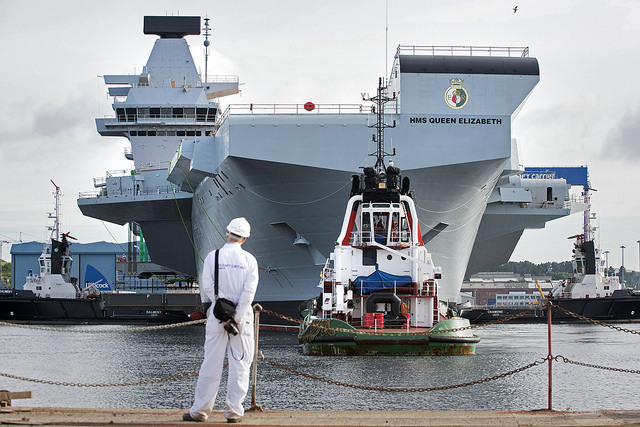 On 4 July 2014 the programme hit national headlines with the naming of HMS Queen Elizabeth. This was a truly wonderful ceremony attended by thousands of people at Rosyth Dockyard whilst being relayed around the country to the other sites involved in the project, as well as being screened live on the web and television. I can only imagine what the total audience was to see Her Majesty the Queen name the ship and the bottle of whisky smash against the bow. ’Great though the naming ceremony was, for me the really important events were just over a week later when the ship was floated for the first time. Unfortunately the weather on the day of the ceremony was nowhere near as good as it had been on the days, and weeks, beforehand but this had certainly helped the team in getting the ship painted and spruced up ready to be presented to the world on the day itself. The ship definitely looked the part and it was very interesting to see the size comparison between HMS Queen Elizabeth in No 1 dry dock and HMS Illustrious alongside in No 2 dock. This is a picture we have previously mocked up with a computer generated image of QEC, but if anything, the actual comparison was even more striking than the image, with the new carrier clearly proving the quote “over three times larger than the existing carrier” which we often refer to. Great though the naming ceremony was, for me the really important events were just over a week later when the ship was floated for the first time by filling the build dock with water, manoeuvring her out and turning 180 degrees before mooring her against the fitting out quay in the non-tidal basin. These evolutions will not only allow the first blocks of the second ship HMS Prince of Wales to be brought into the dock and the assembly cycle to start all over again, but are also necessary to enable HMS Queen Elizabeth to move into the next phase of the programme. Now that she is afloat the team will be able to get the main engine cooling systems working so that the diesel generators can be commissioned, the high voltage systems made live and then early next year, start turning the shafts and carrying out harbour trials of the propulsion system. In parallel with the propulsion system trials, other parts of the team will be completing the outfit of some of the upper areas of the ship, commissioning the auxiliary systems, hotel services, mission systems and aviation systems all in preparation for the Ship’s Company to move on board ahead of sea trials in 2016. While the naming ceremony and un-docking were very momentous occasions in many ways, the project team knows that the next 18 months or so represent probably the most challenging phase of the programme while we turn the ship from being a building site into a fully functioning aircraft carrier. 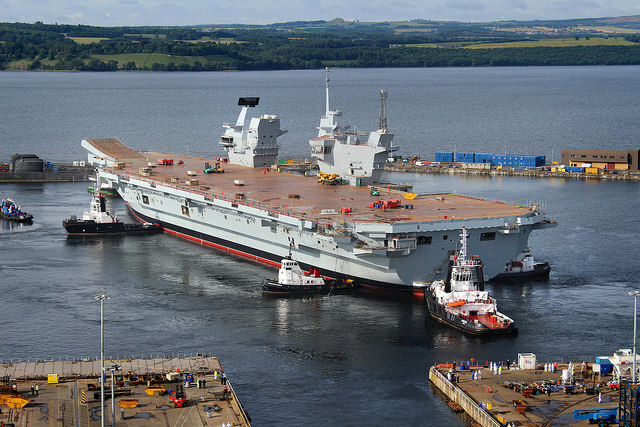 HMS Queen Elizabeth was a very tight fit in the build dock, with the minimum clearance between the bilge keels and the dock walls when afloat being around just 150mm. It was therefore extremely important that as the ship floated up from the blocks on which it has been built, it was exactly upright with no heel angle and minimal fore and aft trim. This put significant emphasis on accurately estimating the weight of the ship and in particular the longitudinal and transverse position of the centre of gravity. While we may have frustrated my colleagues in the very careful and slow process that we filled the dock and adjusted weights on the flight deck accordingly, I am pleased to say that she floated up at level keel and bolt upright! Manoeuvring the ship out of the dock with the aid of six tugs was also a manoeuvre that needed to be managed carefully, but following extensive simulation of the manoeuvre by the pilots and tug skippers, coupled with very benign weather conditions, it was carried out successfully. As I write this, the Naval Architects are on board carrying out an incline experiment through which they will be able to establish the exact displacement and location of the centre of gravity, then the moorings will be completed, shore services reinstated and next week our employees will be back on board and ready to continue the task of delivering the Nation’s Flagships. Very interesting reading the question I have is why build a vessel in such tight building bearths also is there a dock in the UK large enough for her to dock easily?? earners: because buying these from Korea and Japan and Germany is clearly no longer necessary. The national interest is served by having these ships. While market forces have their place I. The economy, making the UK safe means that the economy has a safe place within which to grow. It is not for market forces to defend a nation. It is for the Government to defend the nation and create safe conditions for the economy to go where it wills. The government is not there to build cars or run trains. It is there to create and protect the conditions necessary for the economy to succeed. De Bono was right after all then. PS having on several occasions (both in the USA and UK) attended briefings within the orbit of the military I know well the arguments proposed by military minds to further military objectives. I also had the good fortune to be invited to help implement (at an establishment located not a million miles from Camberley} the teaching method I developed at several universities -the CRASH project where groups of students are given an unknown task at 0900 and must complete, report to their peers by 1230 and write-up by 0900 the next day-something many have been gracious enough to define as the best learning they ever had. Hurrah, at last someone has noticed that these vast vessels, like all capital? ships are vulnerable to attack when isolated. I have a particular interest in this. The father of one of my friends from the Royal Masonic School (only entry exam…that one’s father had been a freemason and was dead) died in WWII trying to take-off from the sloping (sloping because it was about to sink) deck of HMS Glorious whilst it was being attacked by the Scharnhorst. Glorious was on its way back from the disastrous campaign in Norway. Why was Glorious hurrying back to the UK undefended? Because its senior officer wished to institute a Court Martial against the senior RAF officer who had refused to fly some mission, knowing that the campaign was already lost. Nice piece of inter-service rivalry! Amazingly, (it transpired much later) that an ULTRA intercept had learnt of the Scharnhorst’s departure and likely route, but the junior cypher officer [later Sir Harry Hinsley] who passed on this info to the Admiralty was told to mind his own business. Ignorance and arrogance? Criminal negligence! One direct hit from a well aimed missile and the mighty ship goes down………talk about vulnerable.